Note:Strobe flash light ONLY.Other items are NOT included. 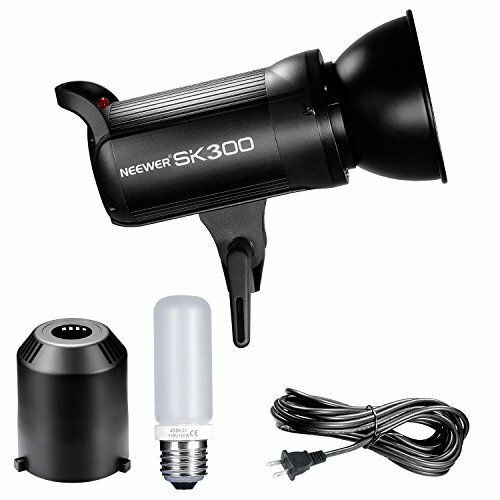 SK300 flash is a lightweight,compact and durable flash with complete functions. Design for studio portrait and e-commerce product shooting. This product is suitable for head shot,waist shoot,certificate photography and product shooting, etc. It can also offer high light,background light or hair light in large studios and workshops. Bowens mount design, compatible with many other accessories like softbox, barn door, snoot, beauty dish and so on. SK300 has precise output displayed on LED panel,20 steps from 1.0 to 3.0 in 0.1 increments. 150W modeling lamp adjusts in 9 power levels.Outstanding output stability,no more than 2% shifts when under the same output. Compact and lightweight body with bowens mount to add almost any studio light shapers. Auto memory and recovery of adjusted panel settings.Anti-preflash function enables synchronization with cameras that have a one preflash firing system. Wireless power control and flash triggering system.Note:Strobe flash light ONLY.Other items are NOT included.